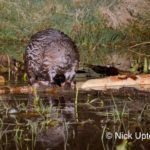 A Bamff beaver enjoys a snack. 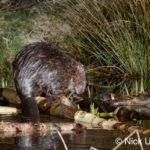 The Bamff Beavers, why and how? 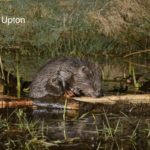 Beavers were hunted out in Scotland by the 16th century and the Eurasian beaver was almost wiped out altogether across the continent by the beginning of the 20th century. 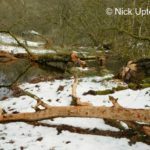 After successful beaver reintroductions all over mainland Europe conservation organisations in the UK began to discuss bringing the beaver back in the 1990s. 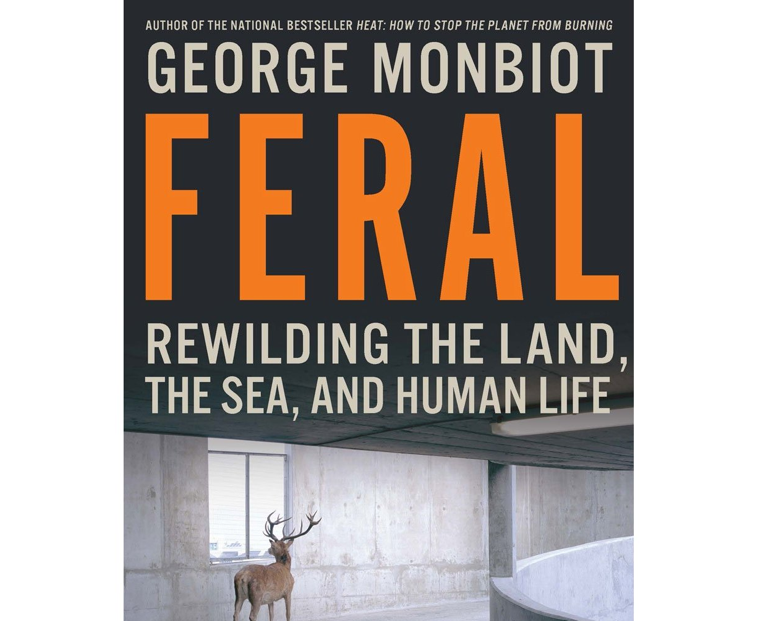 However, consultation led to disagreement and delay over years so some environmentalists decided to start a number of private demonstration projects in large enclosures. 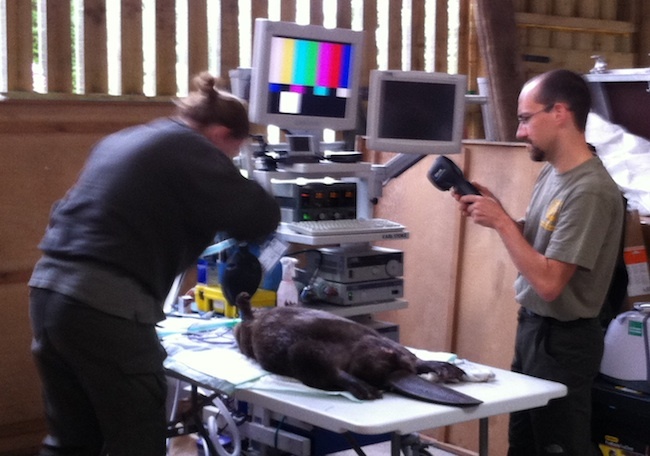 The first of these took place here at Bamff in 2002 when Paul and Louise Ramsay brought in two Norwegian beavers. 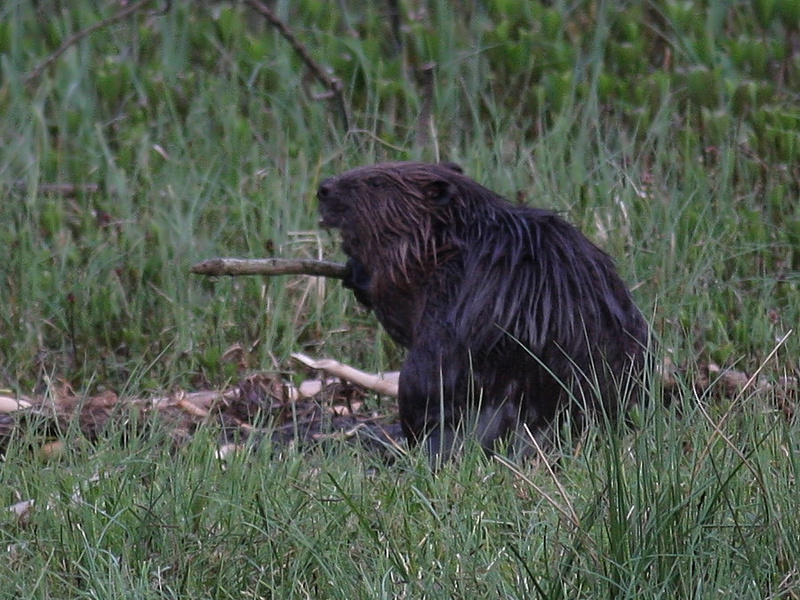 Later two Polish beavers and a number of Bavarian beavers arrived.There were some mortalities in the early years and establishing breeding was a struggle at first. 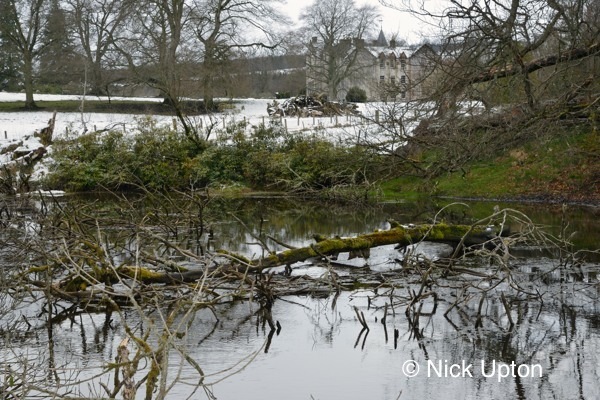 Two families, kept for some years in a very large enclosure, have been breeding now since 2005 and 2006 respectively, and have made a significant impact on the Bamff landscape, converting a ditch into a series of ponds and swamps by building a series of fine dams. 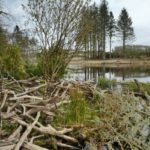 Many wetland species have benefited from this new habitat, including otters and water voles, herons and ducks, as well myriad of invertebrates and amphibians. 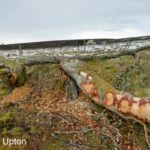 Trees felled and drowned by beavers also offer habitat to many species of fungus, insect and bird, such as owls and woodpeckers. 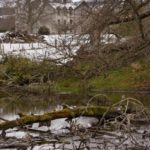 Watching the transformation of the landscape and ecology has been a great source of interest to people visiting and living at Bamff over the years. 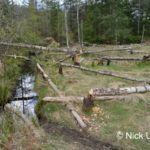 As the years have gone by the beavers have extended their territory, creating an extraordinary landscape of wetlands in between the fields and woods, naturalising the ditch than runs through the low ground of the estate with dams & pools, braids & meanders. 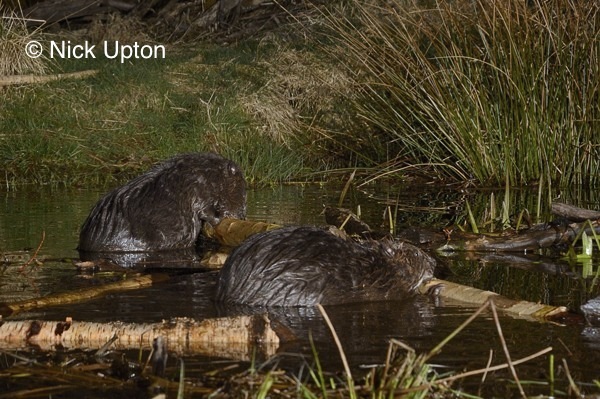 Kits have been seen in all of the last nine years and many people come from all over the country to see this fascinating project – either to sit by the pond on a summer evening to watch beavers themselves, or to walk round the dams and pools and admire their work. There are now a couple of dozen dams and as many pools. The Bamff beavers have provided data for many pieces of academic study, including PhDs, MScs, undergraduate dissertations and school projects. Numerous articles have been written and several films have been made. 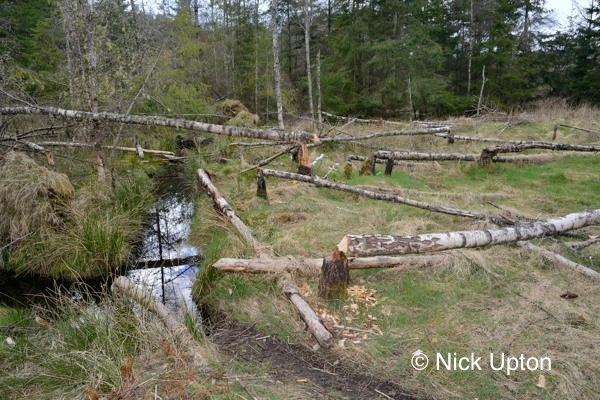 In 2014 Charlie Nash made a film about the Bamff beavers and the beaver debate in Scotland for his dissertation for a UEA/BBC wildlife film making course. Another film was made last year by Russell Savoury formerly of RSPB. 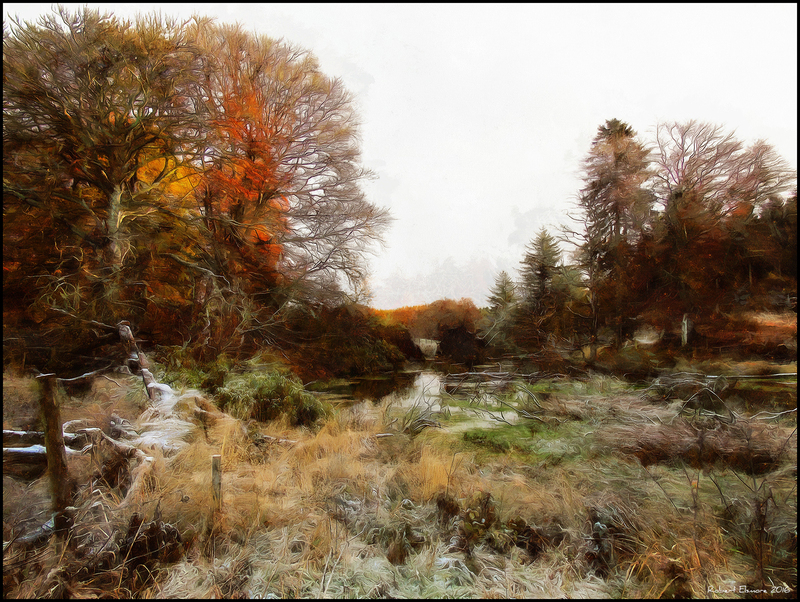 This can be seen on our Facebook Page Bamff Ecotourism. 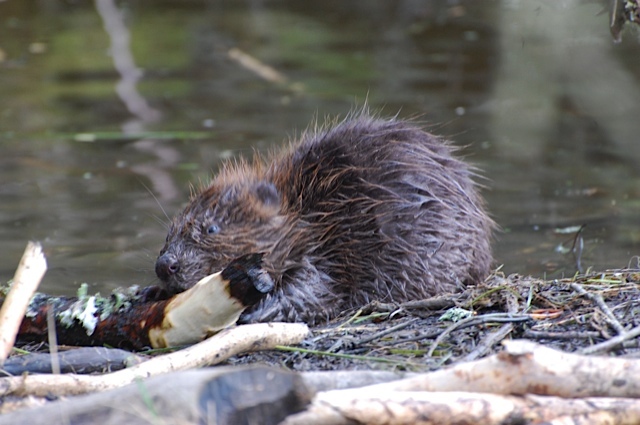 A young beaver enjoys the summer vegetation. 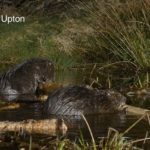 Some general information about beavers. 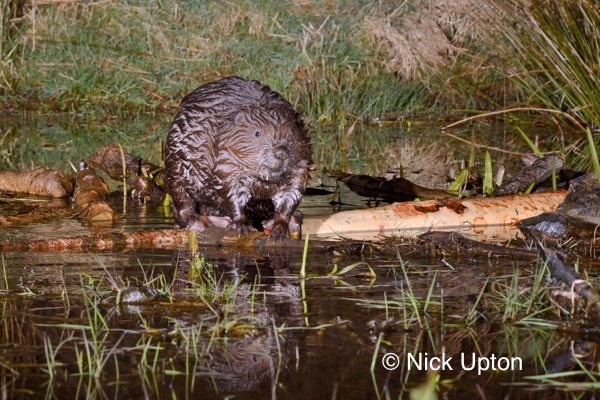 Beavers are semi-aquatic rodents. There are two species – the Eurasian and the North American which cannot interbreed but display similar characteristics and behaviours. They are excellent swimmers and divers, can swim underwater for ½ mile, and hold their breath for up to 15 minutes. 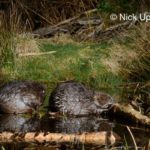 Beavers are best known for their natural trait of building dams in rivers and streams, and building their homes (known as beaver lodges) in the resulting pond. They are the second-largest rodent in the world. 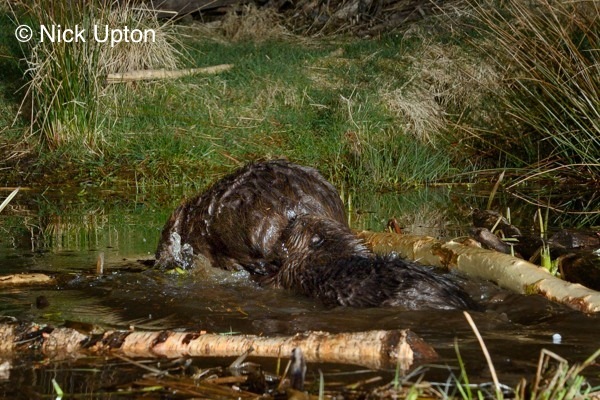 Beavers always work at night carrying mud and stones with their fore-paws and timber between their teeth. The largest known dam was discovered by satellite imagery in Northern Alberta in 2007, approximately 850 meters (2,790ft) long. 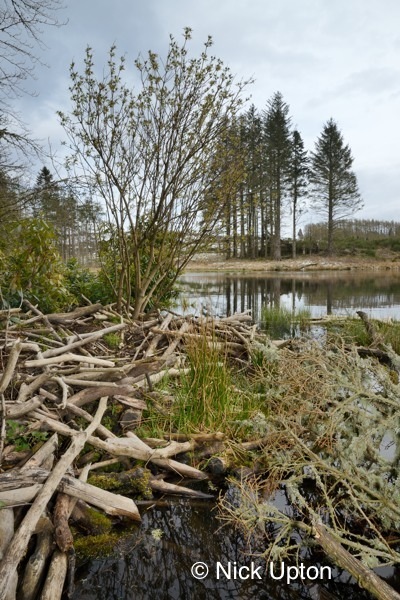 Dam building is extremely beneficial in restoring wetlands and providing habitat for many rare and common species. 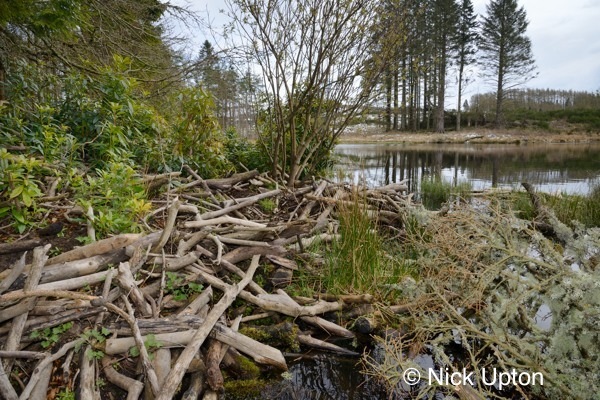 The ponds created by well-maintained dams help protect the entrance of the beavers’ lodge from predators. The lodge is also created from severed branches and mud. 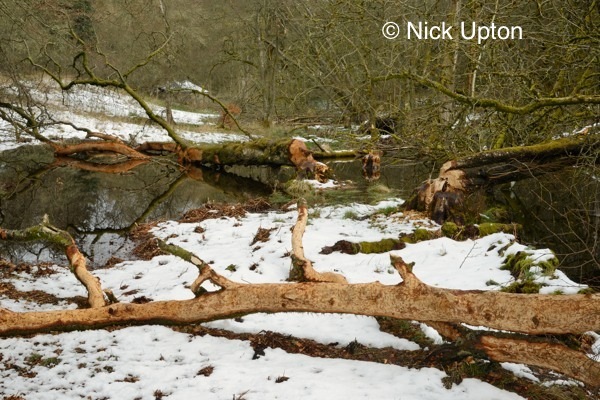 The beavers cover their lodges with fresh mud every autumn, which freezes when the frost sets in. The mud becomes almost as hard as stone. The lodge has underwater entrances to make entry nearly impossible for any other animal. 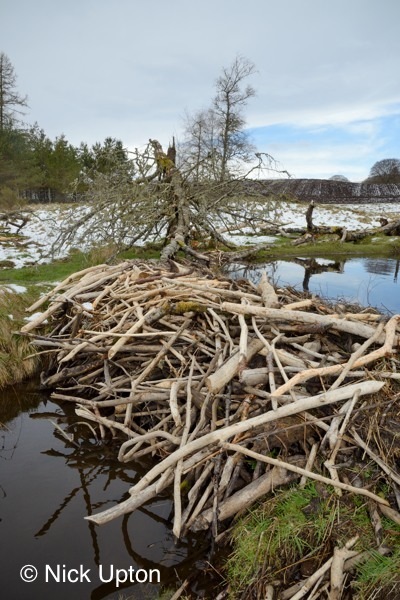 Contrary to popular belief, beavers create the entrance after they finish building the dam and lodge structure. 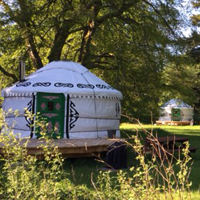 There are typically two chambers within the lodge, one for drying off after exiting the water, and another, drier one where the family actually lives. 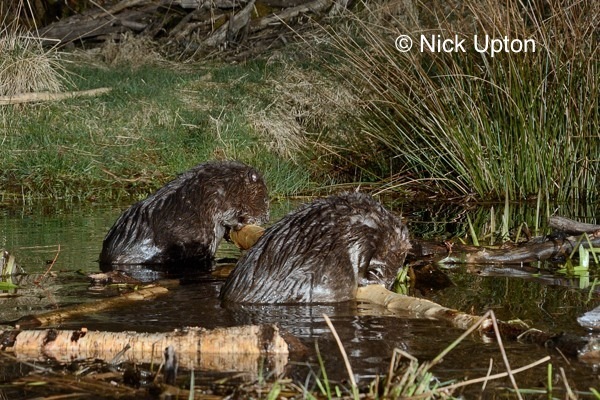 Beavers usually live in family groups. 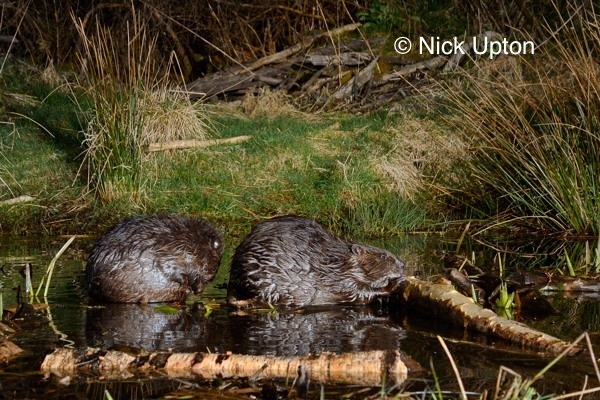 As many as 12 beavers may make up a family, but generally there are 6 or fewer. The group includes the adult male and female, the young born the year before, and the newborn. 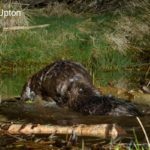 A female beaver carries her young inside her body for about three months before they are born. She has two to four babies at a time. 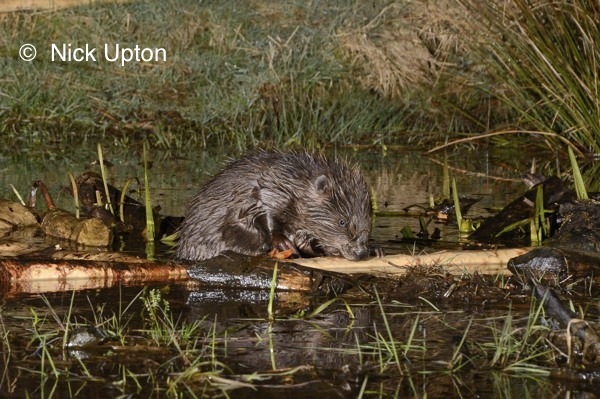 Most young beavers, called kits or pups, are born in April or May. 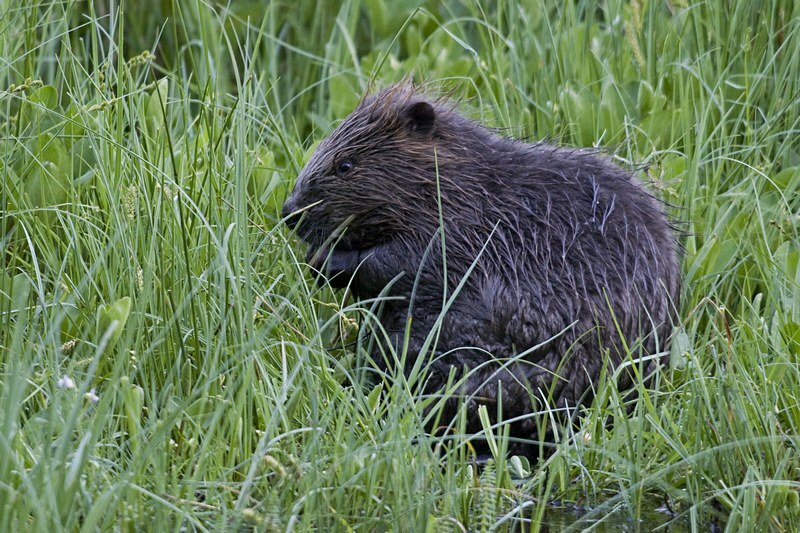 Beavers live as long as 12 years. 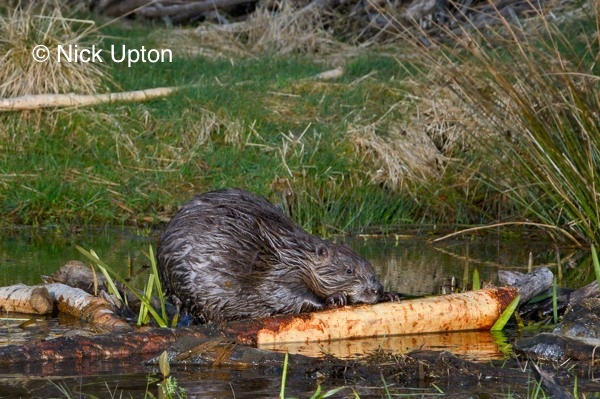 Beavers eat the inner bark, twigs, leaves, and roots of trees and shrubs. Poplar trees, especially aspens, cottonwoods, and willow trees are among their favorites. They also eat water plants, and especially like the roots and tender sprouts of water lilies. 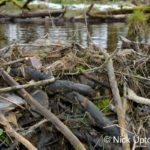 Beavers store food for winter use. 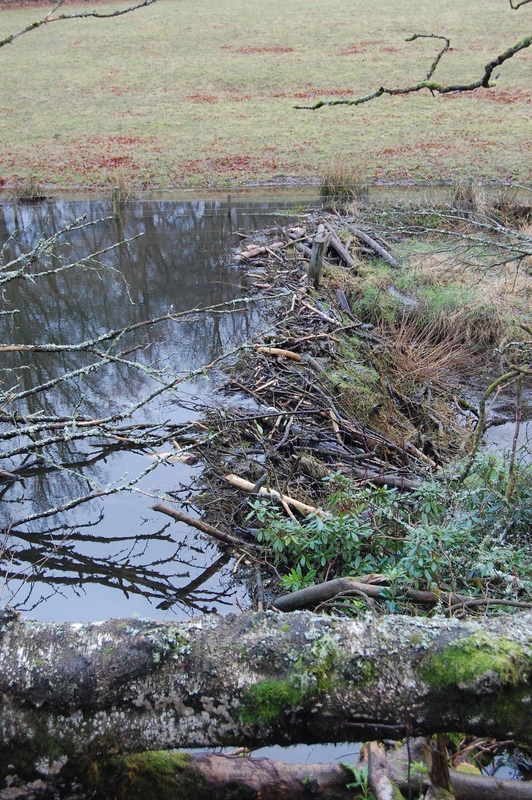 They anchor branches and logs in a cache under the water near their lodges. In winter, they swim under the ice and eat the bark. 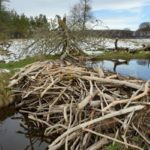 The Ramsays at Bamff have been busy in the last few years campaigning for the future of the Tay Beavers – a population of wild beavers in the catchment of the Tay originating from escapes from enclosures in various parts of the catchment. They have been multiplying since the first were spotted in 2001. The official estimate in Nov 2012 was 145. . 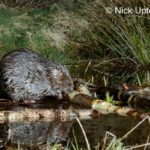 The charity that was formed in the course of the campaign – Scottish Wild Beaver Group – is now working with the Government’s Tayside Beaver Study Group which is currently monitoring the population. Visit the Facebook Group page and keep up with the latest news and discussion. 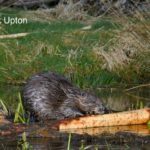 Keep up with the latest posts at Twitter Follow us and keep up with our news and posts about the Tay beavers at Twitter. 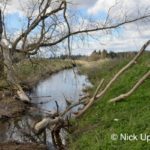 Willow tree (Salix sp.) 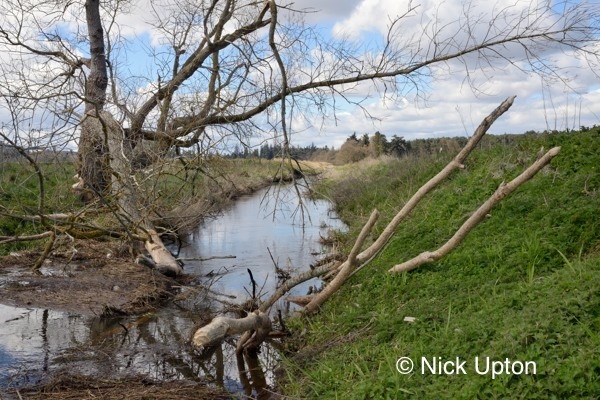 gnawed by Eurasian beavers (Castor fiber) with a large branch lying across and partially blocking a stream in lowland farmland, Dean Water, near Forfar, Angus, Tayside, Scotland, UK, April. 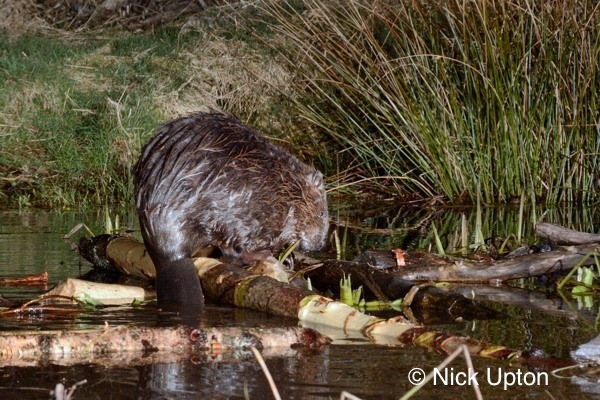 Two Eurasian beavers (Castor fiber) gnawing bark from branches they’ve cut at a feeding station at the edge of their pond at night, Tayside, Perthshire, Scotland, UK, May. Taken with a remote camera trap. Several young Birch trees (Betula sp.) 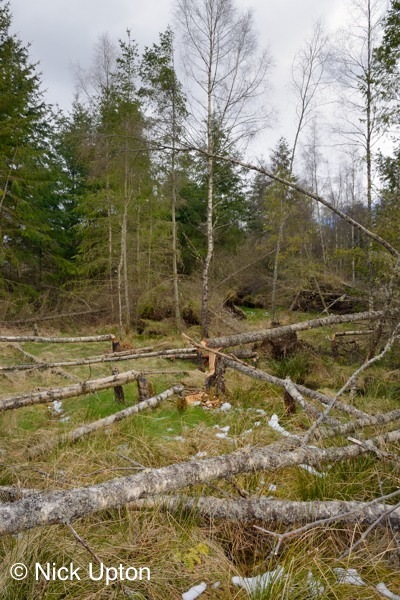 felled by Eurasian beavers (Castor fiber), creating a clearing in mixed woodland, Bamff Estate, Alyth, Tayside, Perthshire, Scotland, UK, April. 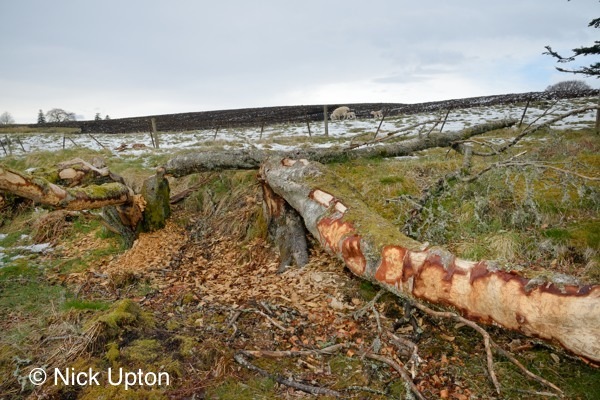 Downy birch trees (Betula pubescens) felled by Eurasian beavers (Castor fiber) with their bark partially gnawed off by them, close to arable farmland and grazing Sheep (Ovis aries), Bamff estate, Alyth, Perthshire, Tayside, Scotland, UK, April. Several young Birch trees (Betula sp.) 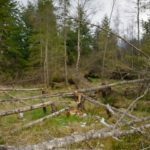 felled by Eurasian beavers (Castor fiber), close to a drainage channel used ror access, creating a clearing in mixed woodland, Bamff Estate, Alyth, Tayside, Perthshire, Scotland, UK, April. 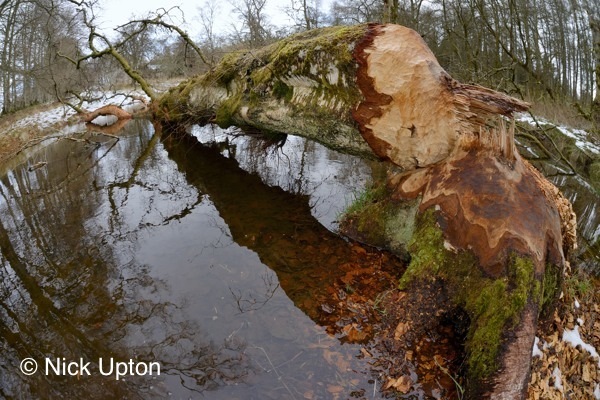 Downy birch tree (Betula pubescens) felled by Eurasian beavers (Castor fiber) with some of its bark gnawed off by them, lying across a stream in the grounds of Bamff estate, Alyth, Perthshire, Tayside, Scotland, UK, April. Fisheye lens view. 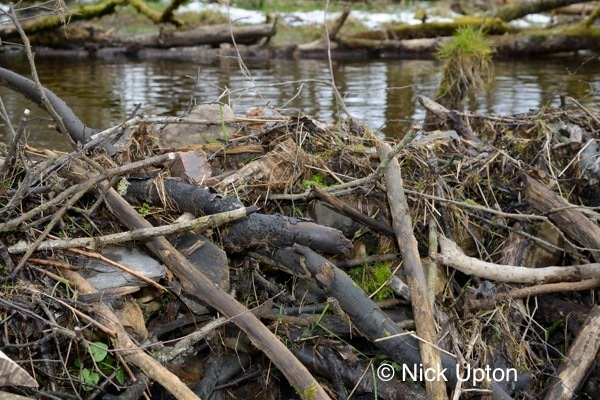 Downy birch trees (Betula pubescens) felled and paretially stripped of their bark by Eurasian beavers (Castor fiber) by a stream in the grounds of Bamff estate, Alyth, Perthshire, Tayside, Scotland, UK, April. 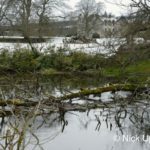 Eurasian beaver (Castor fiber) standing on a branch it has cut at a feeding station at the edge of its pond at dusk, Tayside, Perthshire, Scotland, UK, May. Taken with a remote camera trap. 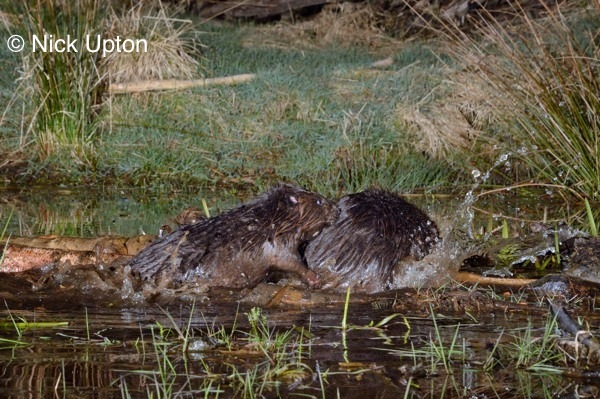 Eurasian beaver (Castor fiber) attacking another to chase it away from a branch whose bark they were both feeding on at a feeding station at the edge of their pond at dusk, Tayside, Perthshire, Scotland, UK, May. Taken with a remote camera trap. 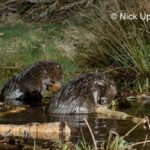 Eurasian beaver (Castor fiber) attacking another to chase it away from a branch whose bark they were both feeding on at a feeding station at the edge of their pond at night, Tayside, Perthshire, Scotland, UK, May. Taken with a remote camera trap. 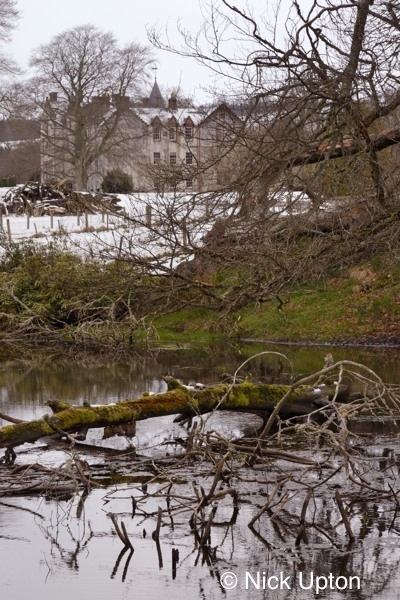 Eurasian beaver (Castor fiber) pond with felled trees in the grounds of Bamff estate with Bamff house in the background, Alyth, Perthshire, Scotland, UK, April. 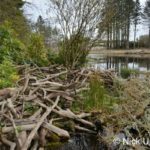 Lodge built with tree branches cut and stripped of bark by Eurasian beavers (Castor fiber) on the shore of a small lake on Bamff estate, Alyth, Perthshire, Tayside, Scotland, UK, April. 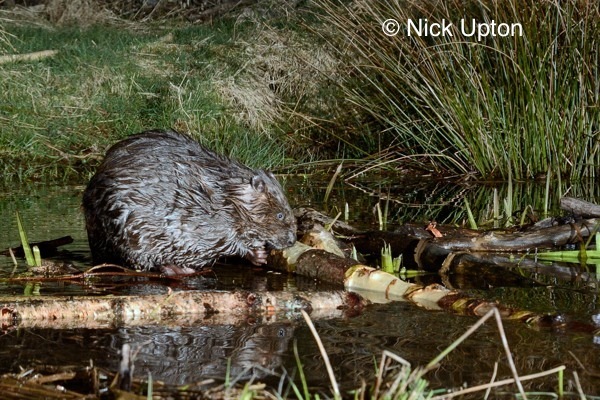 One Eurasian beaver (Castor fiber) grooms as another gnaws bark from a cut branch at a feeding station at the edge of their pond at night, Tayside, Perthshire, Scotland, UK, May. Taken with a remote camera trap. Eurasian beaver (Castor fiber) gnawing bark from a branch it has cut at a feeding station at the edge of its pond at night, Tayside, Perthshire, Scotland, UK, May. Taken with a remote camera trap. Eurasian beaver (Castor fiber) gnawing bark from a branch it has cut at a feeding station at the edge of its pond at dusk, Tayside, Perthshire, Scotland, UK, May. Taken with a remote camera trap. 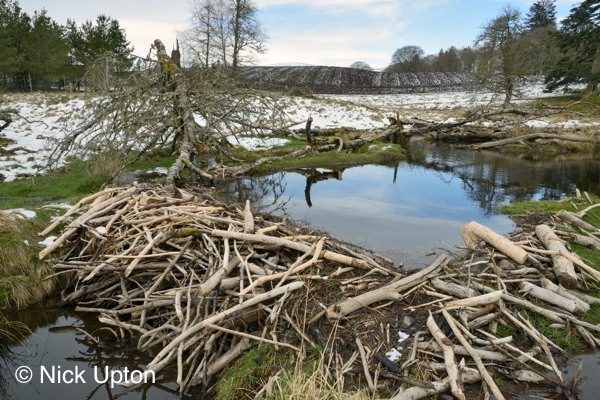 Stream dammed with tree branches cut and stripped of bark by Eurasian beavers (Castor fiber) in the grounds of Bamff estate, with arable farmland in the background, Alyth, Perthshire, Tayside, Scotland, UK, April. 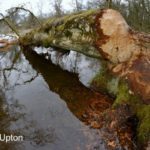 Stream dammed with tree branches cut and stripped of bark by Eurasian beavers (Castor fiber) in the grounds of Bamff estate, Alyth, Perthshire, Tayside, Scotland, UK, April. 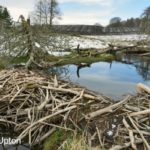 Dam built with tree branches, twigs and large boulders by Eurasian beavers (Castor fiber) across a stream in the grounds of Bamff estate, Alyth, Perthshire, Tayside, Scotland, UK, April. Eurasian beaver (Castor fiber) standing on branches it has cut at a feeding station at the edge of its pond at night, Tayside, Perthshire, Scotland, UK, May. Taken with a remote camera trap.